This week’s fragments seem to have acquired a Tom-themed bent. It wasn’t intentional. My 9 year old, Tom, is having an existential crisis. He sat with tears in his eyes on Monday afternoon and told me that he’s feels like he’s always pretending to be someone other than himself at school, that he feels like there’s part of him missing, that he can’t connect with the other kids and that he’s not being true to himself. He told me he took up playing the flute and being in the band and doing drama classes to help push these things to the back of his mind and help him feel more involved and that it’s not really working. And the wording of all that is straight from him, I’m barely paraphrasing at all. I was a little bit stunned at the level of introspection and self-awareness, especially as his usual conversational gambit is to relate the plot of the latest movie/book/computer game in excruciating detail until I beg him to stop talking. 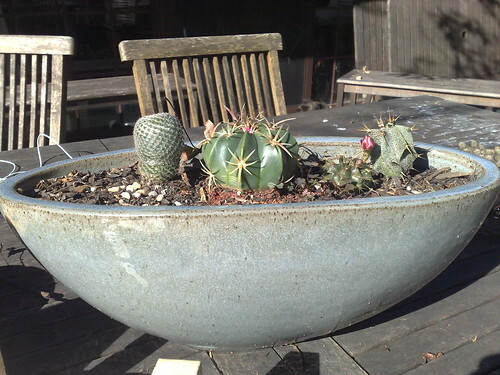 I was sitting on the front deck in the sunshine on Thursday admiring Tom’s cactus garden. He’s got a cactus garden because when we went looking for a pitcher plant to complement his venus fly trap we were told that they don’t sell them going in to winter and that they wouldn’t have any in stock until spring. (I surmise that this is because carnivorous plants die off in cold weather and would look far too pathetic to be sold.) So obviously the solution was to buy cacti instead. 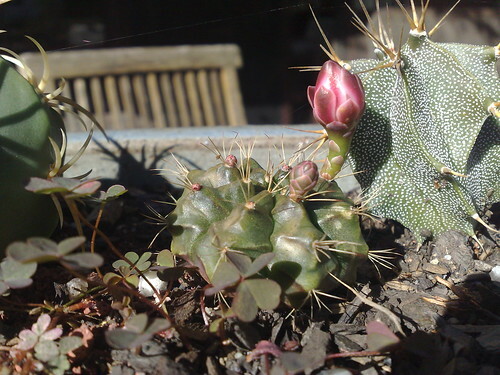 The one with the big thorns drew blood from my thumb before we’d got them back to the car, it’s called a fish-hook cactus. I was a little worried about them over recent weeks, you’re not really supposed to water them in the winter and we’ve had days and days of torrential rain. They don’t seem to mind though, in fact there’s imminent flowering happening. This afternoon I got a call from the school to tell me Tom was looking decidedly green about the gills and could I come and get him. So I rushed to finish off what I was doing, packed all my stuff up, excused myself to my boss and co-workers and was standing at my desk ready to leave. And THEN Adam, who unbeknownst to me was working from home today, rang to ask if the call he had missed on the home number earlier had been me. So I told him to go get Tom seeing as it would take him 5 minutes rather than my 25 minutes to get there. But I came home anyway because I couldn’t be bothered unpacking my bag again. And now I have office work I’ll need to do over the weekend. Bother. Tom is now lying in the sun on a bench on the front deck in his pyjamas. Which is fair enough I suppose. Don’t forget to go visit Mrs 4444’s place and catch up on all the other fragmenting going on about the place! I have no words of comfort for you about Tom that don’t sound flip. It is surprising that he’s so self-aware at such a young age though. Can you not bring the cacti inside out of the rain? I felt a lot like Tom for a long time, actually (and yeah, it kicked in pretty young, and stuck around in greater and lesser fashions for most of my teens). It’s rough when you first find your way there, I think – I remember feeling bad for sometimes ‘faking’ it, feeling detached from social situations, like I was ‘not-me’, or occasionally weirdly manipulative of them (where actually I wasn’t being manipulative at all! ), and so on and so on. Many of the things that have made me feel better about this cluster of feelings include stuff like: the options aren’t authentic and inauthentic, that there’s a lot more complex stuff in between; that even to myself, I’m kind of a mystery – the idea that I know exactly who I am is a funny kind of fantasy that makes me feel like I should be in control of all I do, when actually we’re all just far more complicated, fragmented, mutifaceted and contradictory than that; that a huge number of people feel like this, even in the midst of interactions that I’m worrying I’m the only person feeling kind of out-of-kilter; that ‘faking it’ isn’t necessarily really false, just the sense that a lot of self-awareness/critique can produce; that I don’t really need to have a ‘core self’ that I’m all conscious of and have thoroughly considered and am in control of… in fact, I remember when I was about eighteen realising that how I felt – just how I felt, rather than my rational consideration of stuff – actually *really* mattered. And that whether or not that was okay, it mattered. It seems simple now, but at the time it was really important. I’m not sure why I’m explaining all of this, but I guess part of it is just to say that it feels like a really recognisable space to me, that it can be hard to negotiate, and that kids are often really hard on themselves about ‘telling the truth,’ and ‘being honest,’ in ways that I think are hard to grasp hold of from the greyish area of adulthood…? Yeah, it’s not unfamiliar to me either, especially the disconnected feeling. As I said on facebook I talked to him about how everyone modifies their behaviour depending on the situation they’re in and that it doesn’t mean they’re being dishonest, it’s about doing what’s appropriate and fitting in with the people around you. That seemed to help a bit. I work with, I’m a teacher, nine-and-ten-year-olds, and I can see why you’d be stunned by the awareness of his comments. Can he express what he really wants to be doing? Mostly he just really wants a soul-mate with the same interests as him. Unfortunately he’s not at all mainstream so it might take a while and a larger pool of potential friends before he finds someone! Tom is deep. Already wrestling with such difficult issues. I don’t have any answers as I still find myself struggling with those issues at times. I don’t know who had the more eventful week – – – Tom or Tom’s mom trying to keep UP with Tom. I like it when my fragments take up a theme. Your sweet boy… good for him for being able to articulate all those thoughts! Sounds like you have a great kid. Poor thing, hearing him articulate his struggles to fit in make me a little sad. So he likes horticulture? Is there a garden club at school? Could he start one? awww I hope that Tom is feeling better and figures himself out. It’s tough raising kids.. and sons.. I wouldn’t even know where to start. Wow. I still can’t get over the fact that our seasons are so different than yours in July!